Whether you’re spending the day running errands with your mini-me or venturing on a long road trip, travel toys are a necessity. Children have tons of energy and sitting in the car all day long is bound to cause them to get a little restless. Travel toys will help keep them occupied and make the trip more enjoyable for everyone in the car. When deciding on toys to bring it is best to pick any that are easy to transport, compact, entertaining and most importantly developmentally appropriate. Luckily for you, our list of the ten best travel toys includes a variety of toys that check all of those boxes. In fact, the majority of the toys are mess free and do not include loose pieces, thus ensuring your child can have a blast without creating a mess in your car or anywhere else your family adventure takes you. Traveling with kids can seem challenging, but we want to help. We have created a list of great toys that work well for traveling. Each of the toys have been reviewed to ensure that they are current in the marketplace plus meet the criteria of our website. Each of the sections have been reviewed and information has been added. Although it may seem like our kids are simply trying to push our buttons, there is a basis of logic behind why they constantly try to buckle or unbuckle their car seat straps or grab things off the shelf at the supermarket. The first few years of life are a pivotal time for the development of motor skills as well as awareness and cognitive growth. 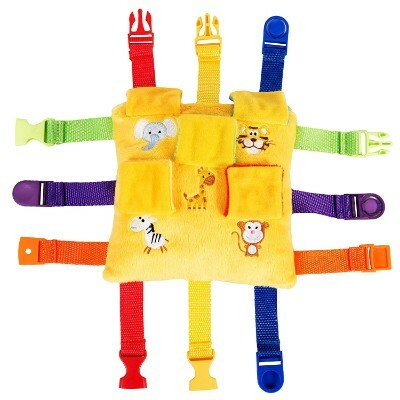 With Buckle Toy’s Bongo, you can provide your child with a multitude of brain stimulating, finger distracting play that can help introduce them to early learning concepts such as geometry and mathematics while also instilling life skills, such as the ability to use zippers and buckles, that will give them a jump on milestones that they will need as they grow. 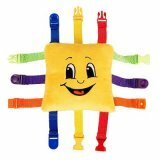 This plush pillow friend can keep your kiddo entertained for hours as they as CLICK and SNAP and ZIP their way to a better understanding of the way their world works. And don’t worry, we checked with several reviewers to make sure that this toy wouldn’t give your little one an incentive to break out of their car seat. In fact, it has been professional safety tested and comes highly recommended for special needs and autistic children as well since the buckles and activities provide a gentle outlet to keep minds and hands focused. This tiny tot toy is just the right size for little hands to manipulate. It may seem like just another fun toy to your little one but Bongo is full of engaging and educating play that can help foster cognitive development. 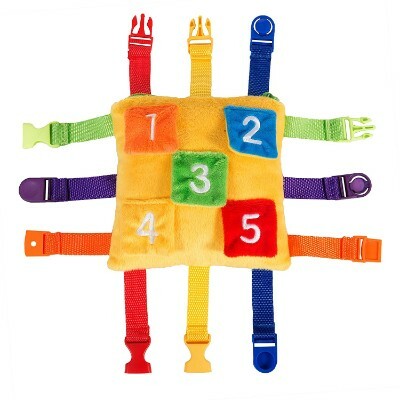 The buckles provide ample exercise for their fine motor skills while the brightly colored shapes and numbers encourage math and counting skills. 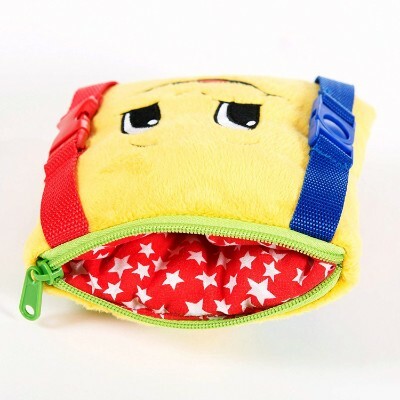 The zippered pocket limbers up those little fingers and provides your child with a hiding place for all of the precious odds and ends that they love. Best of all, its compact size is just right to slip over a shopping cart handle or toss in your diaper bag on the way out of the door so Bongo is always available when he’s needed! Happy little Bongo wants nothing more than to be your child’s best travel buddy and can teach them valuable life skills while also keeping them calm on long trips. 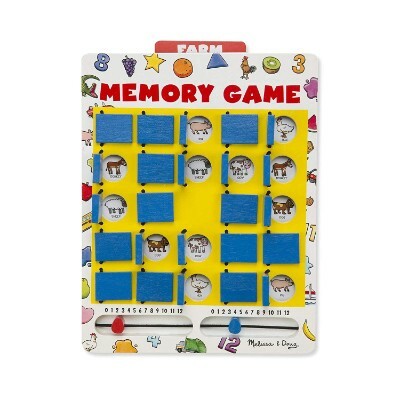 Long car rides just got a little more entertaining with the Melissa & Doug Travel memory game. The board is a wooden frame that is designed with 25 flaps and a sliding scorekeeper. The game includes seven double-sided themed game cards that slide directly into the board. 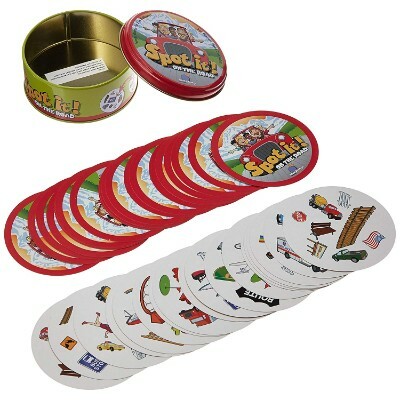 The cards range in themes such as fruit, shapes, farm, colors, and many more. The flaps are attached to the board via a bungee cord which makes them easy to open for smaller children. The cord also keeps the pieces secure to the board, so it’s impossible for your child to lose pieces in the car. Children of all ages can play independently or share the fun with a friend. With the board being made of wood and the cards are laminated each piece is highly durable and designed to survive several years of use. 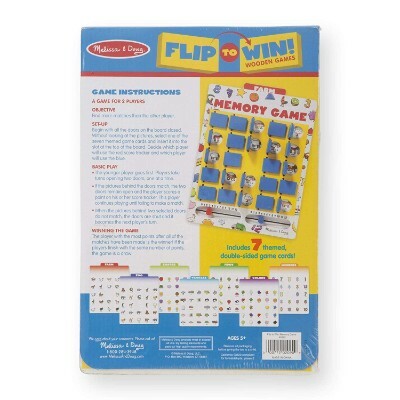 Your child will increase their fine motor skills as they lift the flaps. Their focus and concentration will improve as they work to find the matches on the board. The themed cards will teach your child recognition of colors, animals, shapes, etc. With no loose pieces, this game is ideal for traveling. The objective is easy to understand and the board is easy to use. Not only will this game keep your child entertained on the road but it will also stimulate several areas of their development. Comes in a convenient small tin, so it is easy to carry in Mom’s purse or a backpack. You can change the game rules to meet your child’s needs. 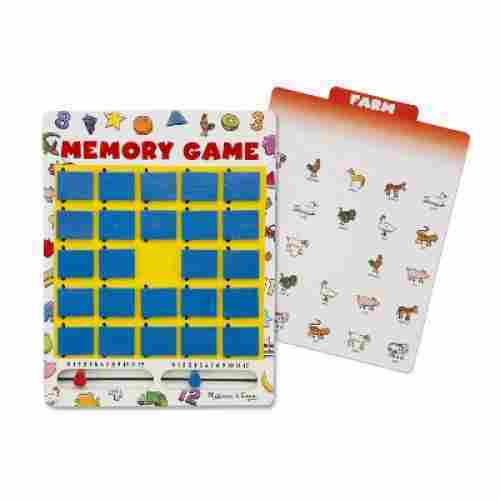 Helps build visual acuity and and pattern recognition. Teachers can use to build vocabulary. Young children may get fidgety while spending time looking for objects on the road. 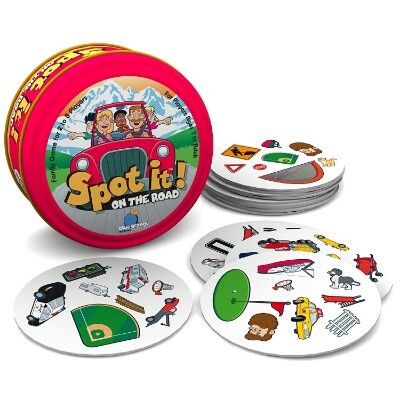 Dubbed by many as the best travel toys for everyone who’s got excellent visual reflexes and knowledge of everyday things that we often see on the road, the Spot It! on the Road provides at least 15 minutes of intense fun and laughter. The length of time to complete one game is just enough to wait for your food to be served at a restaurant or even to kill time while waiting at the airport or any other terminal. Spot It! is ridiculously easy. 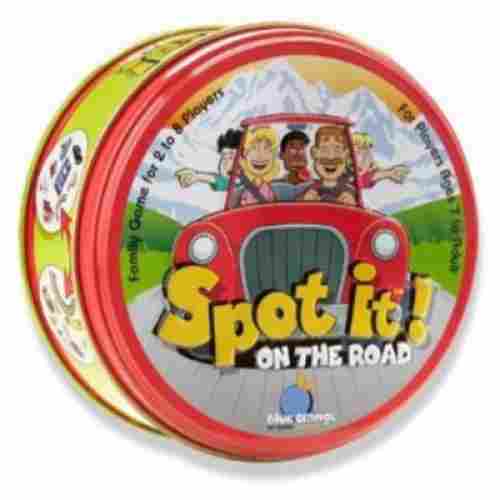 You get a tin can filled with 55 circular discs that have symbols or images of common objects that we see on an ordinary road trip. The point is that each of these discs will have an image that is in common with other discs or cards in the Spot It! tin. The mechanics are simple. Draw two discs at a time and spot which among the images printed on both discs is similar. It’s a test of how lightning-quick your eyes can focus on the one object that is common to both discs. Of course, this is just one version of playing the game. And there are four other ways in which kids can play it. This simply means you are looking at a whole 1 hour 15 minutes to play the entire 5-in-1 game. Not bad for an ordinary-looking tin. Better be fast for this game! You can play the matching images game or match an image to real life, which is the one that works best while traveling. Check the pictures on the card and then try to find them as you drive along. If you have a fire truck on your card, then find a fire truck. Or find the railroad tracks, police car, cat, baseball diamond, and so on. The driver is not allowed to play for safety. 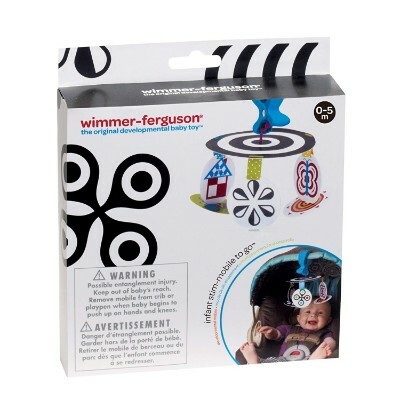 Good for building on visual recognition skills and keeping kids occupied during times that are boring. Teach vocabulary words with the images. For older kids, they can learn to write them down. This is a great teaching tool for teachers, as well. Since the images are different sizes, the game is based on matching patterns and building visual acuity. Spot It! is an ingenious way to kill time while also harnessing symbol recognition and visual-mental association skills among children. What better way for young kids to learn about animals, colors, and shapes than to give them Munchkin’s Traveling Flash Cards? The Munchkin Flash Cards come as 40 durable and glossy cards that feature 80 images that have been carefully selected and designed for optimum mental stimulation. It comes with a grippy handle which can also help provide for a different tactile sensation for young kids. The same handle is excellent for attaching onto any mechanism that has a ring or hanger. 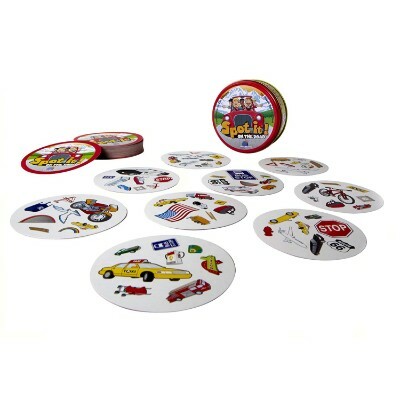 The great thing with the Munchkin Traveling Flash Cards is that it actually encourages young children to recognize a variety of shapes, animals, and colors to help expand their vocabulary, helping develop their language in the process. 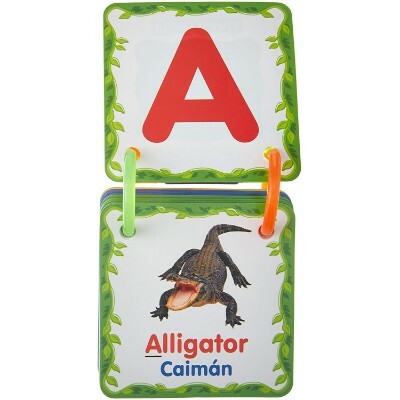 And speaking of language, the Munchkin baby travel toys come as bilingual cards – English and Spanish. This is an excellent feature as it caters to the growing population of Spanish-speaking communities. The same cards can also help young kids learn about counting numbers as well as the alphabet. The Munchkin cards are your portable teacher for your kids on the go. 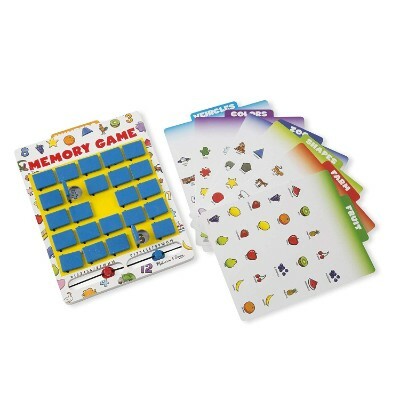 This durable set of flashcards travels really well and is thinly plastic coated so that you can wipe them with a damp towel. The bold colors are attractive, and you can play with your child and use the teaching moments to your advantage. This is a set of cards that supports learning vocabulary, color recognition, counting, and letters,depending on his point of development. The cards are held together by a handle that keeps them all together, which is great for traveling. The Munchkin Traveling Flash Cards is deceptively simple yet has the usefulness of more high-tech learning resources. Attach to carriers and strollers to keep baby occupied. 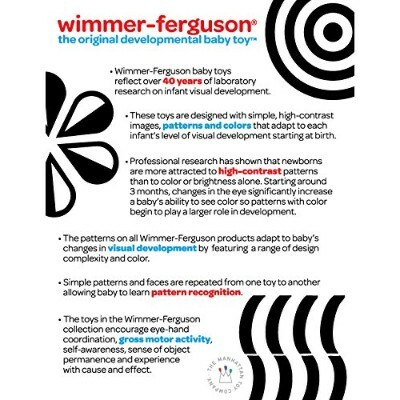 Considered by many as one of the most mentally stimulating baby travel toys, the Wimmer-Ferguson Infant Stim Mobile to Go Travel Toy looks nothing really spectacular. However, if you look at the high contrast patterns and designs of its various wheels, then you will understand that these are essential for optimum multisensory development among babies younger than 5 months old. 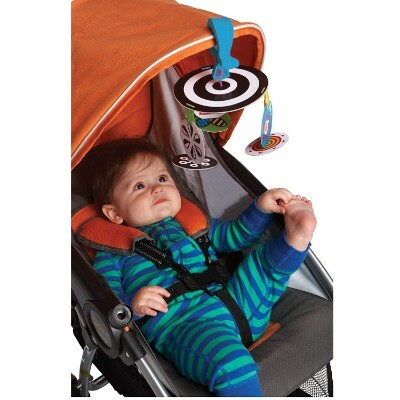 The Stim Mobile can be easily clipped onto any horizontal bar be it on your baby’s stroller, baby car seat, crib, play gym, or even infant carrier. The high contrast black and white patterns help provide the necessary visual stimulation for young babies, laying the foundation for optimum brain development. This essentially paves the way for the more successful cognitive development of children. Babies explore their worlds by soaking up information. They need to be stimulated through sight, sound, smell, touch, and taste. That’s the information they take in. 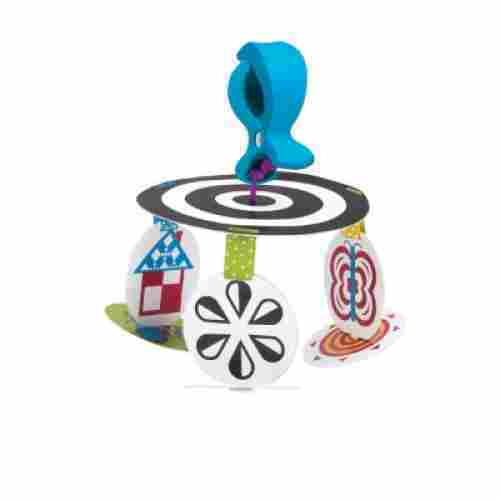 The infant Stim mobile To Go is a toy that can attract babies visually and they change with a baby’s visual development. You can guide your baby’s visual development by using the handy drawings that come in the package so you can change out the paper disks. A child’s development starts at birth and this great mobile can help them along the way. Whether your baby is in the car, crib, or stroller, their mobile can travel with them as it is designed to clip to any horizontal bar. The high contrasting colors will provide visual stimulation to your baby which will help their brain develop. Looking for an activity book that won’t cause a mess? 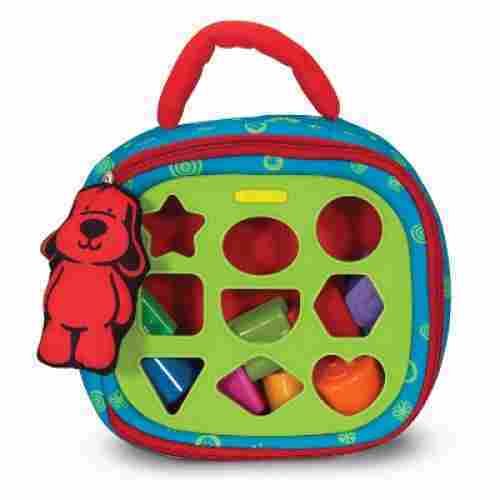 This Melissa & Doug travel toy is just right for you. No more trying to scrub crayon and marker lines off of the tray tables or car seats. If you can pull up a piece of tape, that’s it: you’ve cleaned up any mess this set might inspire. 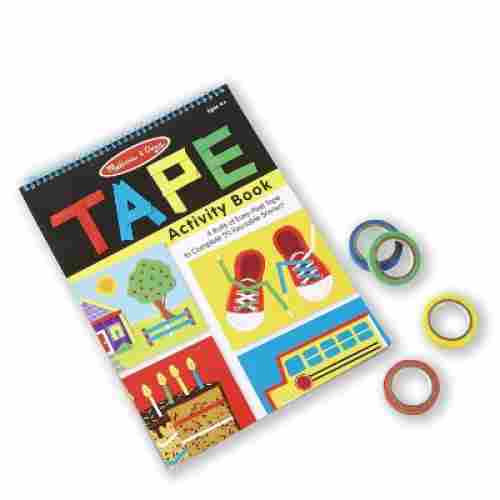 The activity book features 20 reusable scenes that ask children to use the four rolls of colored tape to complete the pictures. Help them criss-cross shoelaces, add colored stripes to the friendly fish, fix up the barnyard, decorate lollipops, and more. 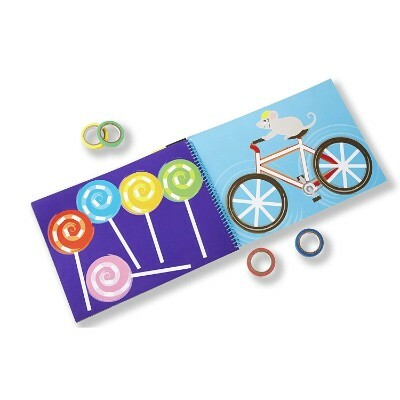 Suitable for ages 4 and up, this little book is visually stimulating with all of its colorful images, encourages tactile, creative play, and is a cinch to pack up and carry around while you’re on the go. The book is designed with a spiral binding that is guaranteed to keep all of the pages together. There’s no need to cut the shapes for your child as the set includes safety scissors specifically designed for children ages four and up. As they work through the activity book they will increase their fine-motor skills and hand-eye coordination. Furthermore, their color-recognition and problem-solving skills will improve as they work to add color to each page. 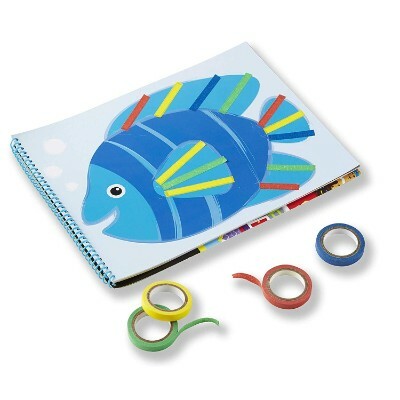 When your little one is done being creative, they can store the rolls of tape on the front of the cover for when they are ready to play again. This activity book is a great way to allow your child to get creative on a road trip without any mess causing damage to your car. With the tape being stored on the front cover this book is super easy to transport from place to place. The ‘ink’ evaporates and you can color again. Kids will doodle away the hours in the car or while waiting. Doodling is a great way to kill time while also giving you the opportunity to let out the creative nature in kids. 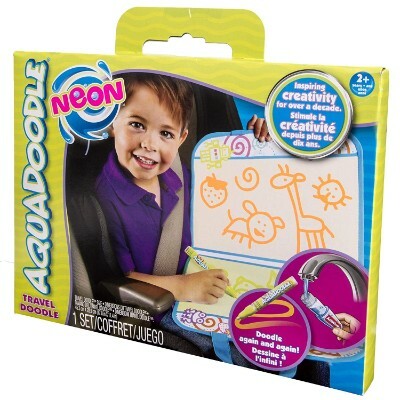 The AquaDoodle Neon Travel Doodle is a mess-free and absolutely fun way to doodle whatever it is kids have in mind. The ink will never run out because all it needs is water and your kid can be literally doodling all the way until he or she reaches adolescence. 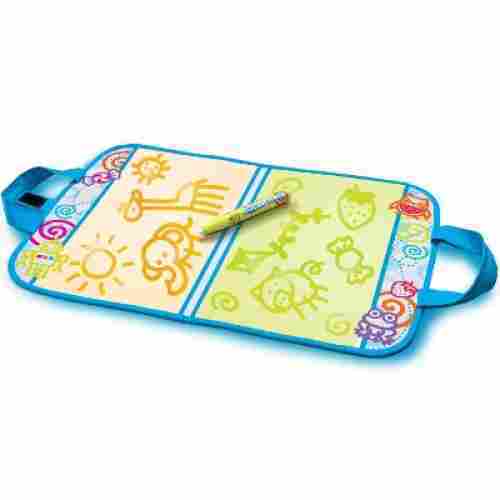 The drawing “board” is actually made of soft fabric with a plastic drawing surface making it super-easy to erase the doodles. You can even use the Neon Doodle for your own work especially if you have an idea that you want jotted down and the screen on your smartphone simply isn’t big enough to accommodate what you have to draw. The Aqua Doodle Neon is one of the best travel toys for children as well as preschoolers as it gives them the chance to explore their creative abilities without creating a mess and without running out of ink. You wanted a no mess travel toy for your little one? 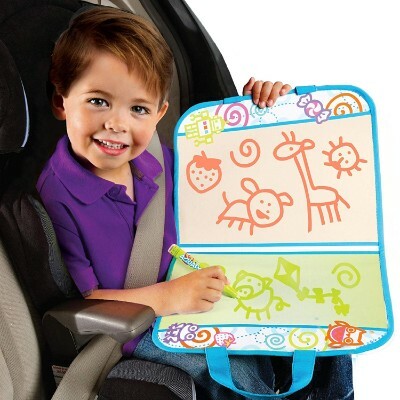 Look no further than the AquaDoodle Accessories Travel Doodle. This is so great because the pens just get filled with water and the color comes out on the special board. Your child can doodle a masterpiece. Clean up is non-existent as the water evaporates, and the color goes with it. Drawing comes from copying or imagining symbols and imagery. Markers can be used to draw and color and it helps kids communicate through pictures and colors. Repeating symbols and images through drawing helps kids learn about communication, numbers, and the world around them. The water-based pigments for the drawing pens of the AquaDoodle is really something. At any rate, you don’t have to worry about running out of ink ever again. Does your child have a creative flair? 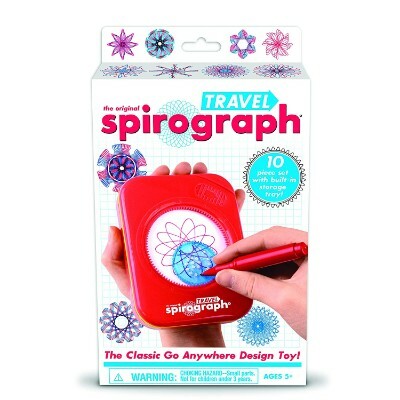 Why don’t you cultivate this creativity with the Travel SpirographPlayset? Don’t ever downplay this simple and small handheld device as it just happens to be one of the most creative travel toys for kids specifically designed to stimulate their creativity wherever they are. 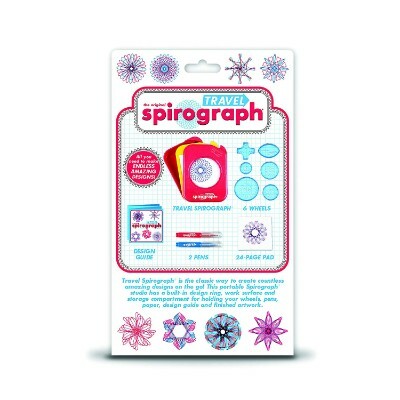 The kit comes with 6 pieces of spirograph precision wheels and 2 design pens that are especially made for the kit. 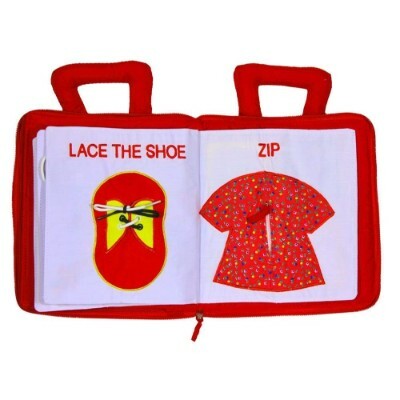 It also comes with a 24-page design pad which your kid can easily place into its designated compartment. Keeping and organizing the wheels and gears is made easy with a built-in storage tray. The playset is just perfect for killing time while also feeding your child’s hunger for some creative streak. Let him or her create fabulous spirals or even his or her own interpretation of what a mandala should be. 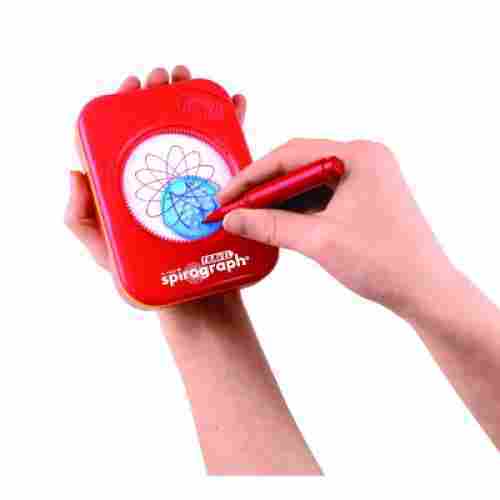 The point is there will never be a dull moment whenever your kid has the Travel Spirograph right in his or her hands. Remember Spirograph? Many ‘Boomers’ had the large version of this artful design toy as kids. The travel version is a convenient way to share your nostalgia with your kids. Your child can design away for the entire ride, then maybe even color the pages. 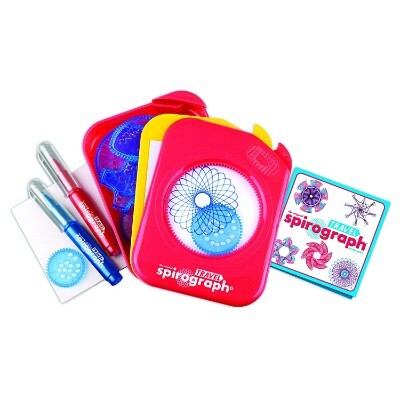 The Travel Spirograph Playset is packed in a neat little box that holds paper, pens, and design wheels. There are two pens, red and blue, and 6 wheels. Children will have to use a little patience with some of the wheels as they are odd shapes, so they don’t go around as easily as the round wheels. The pocket spirograph is a wonderful device that follows in the tradition of an original concept enabling kids to make wonderful works of art anytime, anywhere, literally. Sometimes all mom and/or dad really wants on a road trip, plane ride, or vacation is a little peace and quiet. It can be difficult to find those few moments of serenity when you have excitable little ones vying for your attention and needing constant supervision. 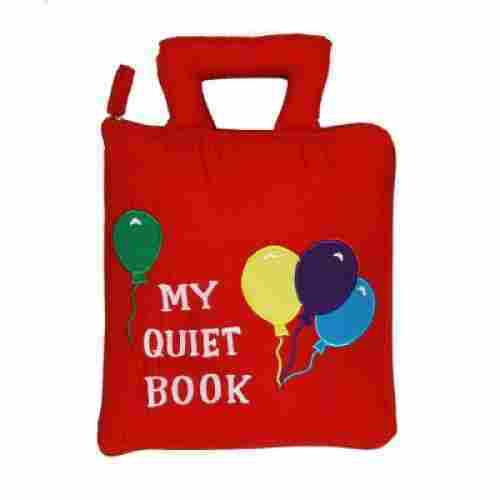 But the My Quiet Book might yet be able to afford you a brief break amidst all the chaos. This child-friendly plush book features very basic activities that intrigue tots still developing their fine-motor skills and dexterity. he activities are soft, silent, and designed with just the right learning curve for 2 and 3-year-olds. Button a button, zip a zipper, snap a snap, or tell time on the fabric clock. The different textures are both safe and stimulating, and all pieces are tethered to the book so you can’t lose any as you race around, trying to get to your destination. The zipper is cloth instead of metal, and the shoelaces have been tested at rigorous government standards to make sure their length is safe for curious children. This cozy book will provide hours of quiet, engaged play for your tot. 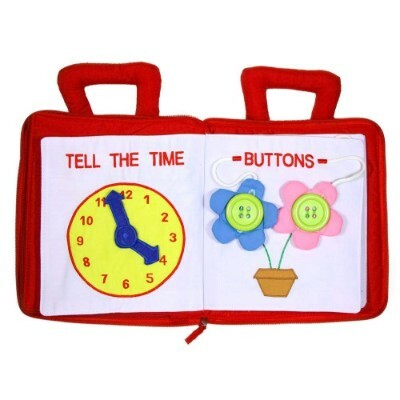 Designed with a built-in cloth handle, your child can easily carry their book from place to place by themselves. The pages are filled with bright colorful objects that will stimulate your child’s sensory skills and have them excited to learn. 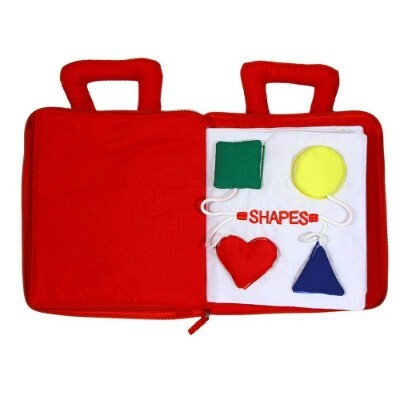 As your little one flips through the book their knowledge of shapes, and colors will increase. If you happen to find your child’s book covered in their favorite snacks after a road trip, simply toss it in the wash to return it to normal. It’s a simple and safe concept. It’s soft, which children will love, colorful, which draws their eyes, and has a lot of interactive interface to keep them busy and focused while mom and dad take a break to catch up on other work, or, just maybe, spend a few moments pampering themselves. 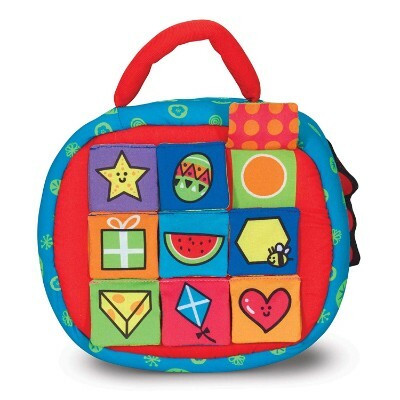 One of the best travel toys for children and even for babies is the Melissa & Doug’s K’s Kids Take-along Shape Sorter. Technically, it’s a very simple puzzle where young tots will have to use their cognitive abilities and mastery of their motor skills to slot textured blocks into their respective holes. The blocks also come in different colors for added visual stimulation while also enhancing their awareness and understanding of colors. The other side of the padded casing features 9 square flaps that contain images of everyday things or objects. Flipping the panel of each of these crinkly squares will reveal the geometric shape of the item depicted on the cover. 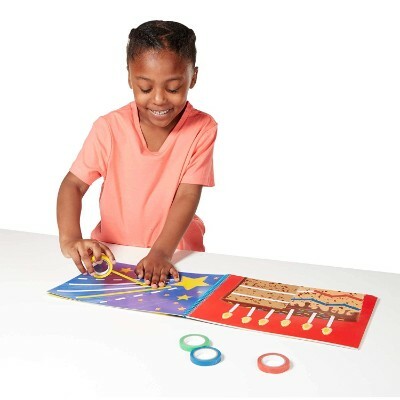 So, while your child is waiting for his or her turn at the doctor’s clinic or even waiting for your flight for that once-of-a-lifetime holiday overseas, your kids can play with the K’s Kids Shape Sorter and refine their fundamental cognitive abilities. 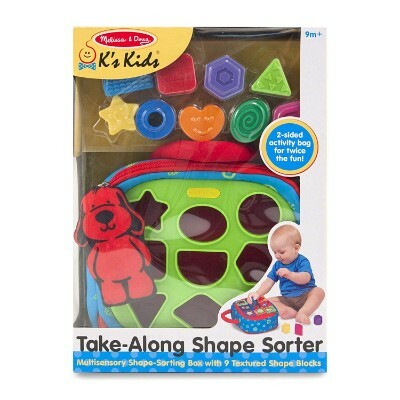 Melissa & Doug have done it again with their K’s Kids Take-Along Shape Sorter. The tote sports bright, beautiful colors with the shaped holes on one side and crinkle shape flaps on the other side. Your child will be able to talk to the little plush toy that is attached to the zipper. 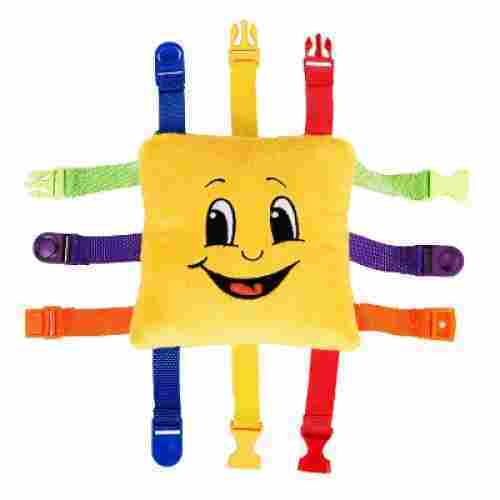 This is easy for children to grab and hold on to while they operate the zipper. Oh, the fun of pushing the shapes through the holes then packing up and carrying the tote by the handle. This is a toy your baby can play with for hours. The K’s simple design yet very utilitarian function is superb. It’s a great way for young kids to make use of idle time. We do our best to match toys with the intended age groups and the safety factor that goes with the age group. While the travel toys list is meant for fun and relaxation on a road trip, we want them to have at least some benefit to a child’s physical and mental development. 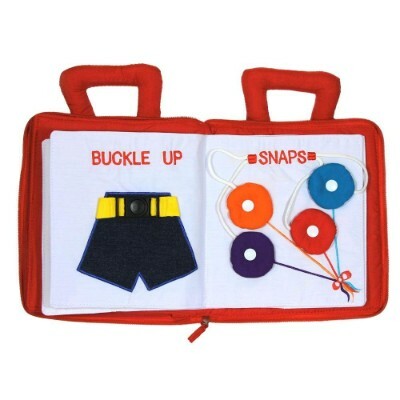 Children can still work on developing their physical skills while traveling, so we focused on fine-motor skills with toys like drawing kits, and those that have buckles and zippers. Toys that are manipulated with the fingers build those tiny muscles and increase their strength, so they can manipulate small objects with ease. Such play also increases hand-eye coordination. Kids grow up and mature mentally at the same time as they do physically. The two go hand-in-hand. So while the fingers and hands learn to manipulate objects, the mind is learning about cause and effect, problem-solving, math, communication, vocabulary, numbers, shapes, and more. These different little "jobs" we give kids are what helps them learn. So buckles are good, sounds are good, buttons and blocks are good. But in the car, sounds are not so good, as they can drive a parent nuts. So we focused on toys that are easy to pack, don’t make a mess, and have their own container so they are easily carried and unwrapped. The markers in the drawing kits make no mess. And they don’t make noise!We want manufacturers to have really good reputations in customer service, toy safety, and an eye on how their toys support child development. There are many wonderful toys out there, so the personality of the toy makers is important. We are looking to choose toys by companies that have good reviews and few valid complaints. Traveling with kids and even small kids can seem overwhelming, but the good news is. The more you do it the easier it will be. You will learn what you really need and what you really didn't. Plus as the kids travel more they will learn to adapt. Packing engaging toys and snacks can be a life saver when you are traveling. When the kids become overwhelmed a nice break with a snack and a toy can reset them for fun. When choosing toys, safety, of course is uppermost in our minds as we research the toys for our list. Not every incident can be foreseen, though, so parents have to be vigilant while their kids are playing, and we know you are. So for us, safety means, among other things, rounded corners, nothing that will pinch fingers, softness, and strength. If the company has certificates or an award, that is a plus. We wanted all of the toys on the list to be attractive and fun. 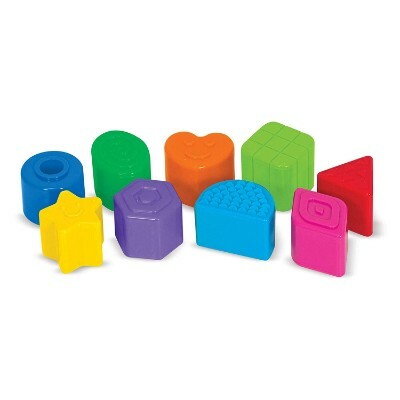 So we chose toys with bolder colors, interesting shapes, and appropriate complexity to keep kids engaged in their play. If it’s not attractive and fun, children will tire of it easily and want to move on to something else, and there is a limit to the number and types of toys you can take travelling with you. And, of course, the toys have to be small enough to easily pack and retrieve in the car. The carrying cases with handles are also good options. Travel toys are not inherently difficult to choose. As long as it can keep a child’s attention and focus to let the passing of time breeze through without much incident, then it should be perfectly alright. Unfortunately, doing is definitely different from merely saying it as we were literally bombarded with many potential candidates to our shortlist. We had to cut the number of these prospects down to a more manageable size so we included only those that have at least 4.3 stars in their customer satisfaction scores. Of course, we balanced this with both the positive and negative feedback or comments for each product to come up with a more realistic assessment of the overall usefulness of these play things especially in keeping children preoccupied during long travels or even unusual transport delays and stopovers.Equally important was the product’s appropriateness to the developmental level of its target audience or users. For instance, if the product calls for some form of holding something, then it was imperative that the child’s gross-motor skills are already well-established. Otherwise, we will only be wasting our effort in coming up with a list that’s grossly disproportionate to the developmental skill level of its intended user. So, the product’s developmental appropriateness was indeed a very crucial factor in our selection. The product’s safety profile was also important. It pays to choose only products that will not bring harm to our children, especially the young ones who may not yet have an idea of what safety is all about. As long as certifications exist as to the safety of a certain product, we made sure to include it in the shortlist. Going on a trip with kids in tow can be a very interesting prospect for many parents as it gives them the opportunity to treat their kids to people, places, food, and events that may not be the same as what they have at home. While traveling with kids can be a nightmare for some, it is pure joy for most. Technically, the major concern of parents is how to survive a dull and boring road trip especially that young kids are not known for their patience. Here are some tips to minimize boredom and make travels for kids more fun. Plan, plan, plan. – You don’t need a foolproof plan to make kiddie travels fun. At least have an idea of what you need to do, see, stay, and experience. Do allow for some spontaneity though. Observe only one pace-–your kids’. – Young children, especially children, require time to really explore new surroundings as well as adjust to each circumstance or situation. If you think going to a park will take you two hours to appreciate everything, double or even triple that time for your tots. Be prepared for any weather. – This is part of contingency planning. The point is you don’t want to spoil your kid’s fun simply because of unforeseen weather disturbance. So, you must be ready for everything and anything. Let them choose the travel toys they would like to bring. – Be mindful that the toys in this case are primarily intended to break the monotony of long drives and long waits. As such, one or two of your kid’s favorite toys to keep him or her company should be enough. q: How do I know my child will like the toys I choose for our trip? No one can tell the future, but the first thing you can do is ask your child. Kids do better if they are part of the solution. Let him pick a few and you pick a few. Remember to follow the guidelines of: keep it small, keep it interesting, keep it no mess. And no small pieces as they can be swallowed or lost in the vehicle. q: What if my 7 year old loses interest in the toys we have brought on our trip? In that case, they may fall asleep. But if they don’t, you could play "I see it"-type games by looking out the window. Use this time to get your child interested in something else. Use it as bonding time. Talk about the fun things you will be doing on your vacation. If you have a drawing kit along, ask him to draw a picture of what you will be doing or something you did together in the past. The possibilities are endless. q: My son can be a nightmare in a car. He drives his dad nuts with all of his moving around. What can we do to calm him? There could be many answers to that question, but our first suggestion is to seek out a therapist. The therapist can help if there is any diagnosis to be made. Failing that, try a fidget toy. Some say it can help people to focus on what they should be doing and help with boredom. q: I can only afford one travel toy for my kids. What are some other ideas for playing calmly in the car? First, it’s ok. You don’t have to go buy a whole bunch of games to take with you. Choose some from home. There are lots of window games you can play. Play I Spy….count cows and horses or trucks. License plate games can help your kids recognize states, numbers, and letters. Take crayons and paper or a coloring book from home. These are just as good as a toy to keep young minds busy. You can pass the paper around and play a game like hangman or print games from the computer. Or maybe they can just read a book if they are old enough and don’t get car sick. The list of activities is endless. q: Why are there no electronic devices on your list? Electronics have their place in travel plans for sure. Movies and games can keep your little one’s attention in the car just fine. However, kids also need to play with toys and use their hands in order to learn things. And with a dvd in the back seat, parents can’t see the movie and enjoy it with their kids. We believe in sharing family time, and it’s much easier for parents to interact with their kids when they can pass a toy or drawing paper around and share ideas. q: What are the average ages recommended for these toys? While children and preschoolers tend to be the age group that could really utilize a distraction during travel time, the most we tried our best to come up with an assortment of options for this list that will be of interest to any child from infants to teens. q: Are there any safety hazards with these travel toys? We only included items that have been safety-tested and are made with child-safe materials, however some of the games and toys are designed with older children in mind and may contain small pieces that could present a choking hazard. Use your best judgment about whether a particular toy is right for your child.